JOHN 14:6 KJV "Jesus saith unto him, I am the way, the truth, and the life: no man cometh unto the Father, but by me." 3And if I go and prepare a place for you, I will come again, and receive you unto myself; that where I am, there ye may be also. 4And whither I go ye know, and the way ye know. 5Thomas saith unto him, Lord, we know not whither thou goest; and how can we know the way? 6Jesus saith unto him, I am the way, the truth, and the life: no man cometh unto the Father, but by me. 7If ye had known me, ye should have known my Father also: and from henceforth ye know him, and have seen him. 8Philip saith unto him, Lord, shew us the Father, and it sufficeth us. 9Jesus saith unto him, Have I been so long time with you, and yet hast thou not known me, Philip? he that hath seen me hath seen the Father; and how sayest thou then, Shew us the Father? Iesus saith vnto him, I am the Way, the Trueth, and the Life: no man commeth vnto the Father but by mee. 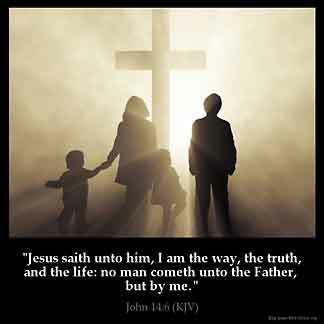 Jesus saith unto him, I am the way, and the truth, and the life: no one cometh unto the Father, but by me. Jesus said to him, I am the true and living way: no one comes to the Father but by me. Jesus saith to him, I am the way, and the truth, and the life: no man cometh to the Father, but by me. I am the Way, replied Jesus, "and the Truth and the Life. No one comes to the Father except through me. Jhesus seith to hym, Y am weie, treuthe, and lijf; no man cometh to the fadir, but bi me. 14:6 To the question concerning the way, he answers, I am the way. To the question concerning knowledge, he answers, I am the truth. To the question whither, I am the life. The first is treated of in this verse; the second, #Joh 14:7 |- 17; the third, 14:18, &c.
Joh 14:6 I am the way, and the truth, and the life. This is said in reply to Thomas. Without him there would be no Way revealed; no divine and saving truth, no immortal life. No man cometh unto the Father, but by me. Not only can no one enter the Father's house without him, but no man can come to the Father on earth so as to enjoy his favor. "There is no other name given under heaven among men whereby we must be saved" (Ac 4:12). I am recovering from my first cancer surgery. As I was to the second decade of the Sorrowful Mysteries" of the rosary, I had to look up this passage. It sent me into significant prayerful thought and bible study. My husband attends Christian church with me now. Catholics need to spend much more time teaching John 14:6. John 14:6 is one of the most important verses in the Bible. There is NO OTHER WAY to life. In Yeshuah Jesus is Salvation. His name means "Jehovah is Salvation ". Jesus is Jehovah God!! We sing this verse in church a lot. The girls sing one verse and the boys another. Try it. It 's a great song! Jesus is the way and even the way to God the father. He is the way to solve any problem we might encounter. Our sinful lives do not let God have an affair with us directly. We are saved by grace and for the sake of Christ. That is why we must end our prayers with the name of Jesus Christ. He the truth. The truth is nothing but word of God. Jesus is the truth because he had revealed every gospel which seemed hidden to us. He is life as John 10:10 has proved this. May God help us in Jesus ' name.